Lily Beans you are the macaroni to my cheese. 1. Paint all your toilet paper rolls yellow. Make sure to paint the inside of the tubes as well. Let dry. 2. Lay down your poster board and trace a 11.5" circle on your blue construction paper. It helps to use a compass. I didn't have one so I had to walk around my house trying to find a large enough circle. Cut out the circle and using spray glue apply it to the center of the board, about 6.5" down from the top. I used a thin paint brush and painted a thin turquoise blue line around the circle as well so it matched the real Kraft box. 3. Trace "CHEESE" with your large letter stencils onto the yellow construction paper. If you don't have stencils, you can aldo buy the 4" letters in the sticker aisle and stick them to your paper (lightly) and cut out the letter then peel the sticker off. That's what I did, because I was too lazy to buy stencils and I already had a bunch of sticker letters. 4. For the "MACARONI &" I used cork sticker letters and painted them yellow. You could also paint white sticker letters with your yellow paint. I think this is a lot easier than using tiny stencils, but it's your call. 5. Apply all your letters with spray glue and let dry. 6. 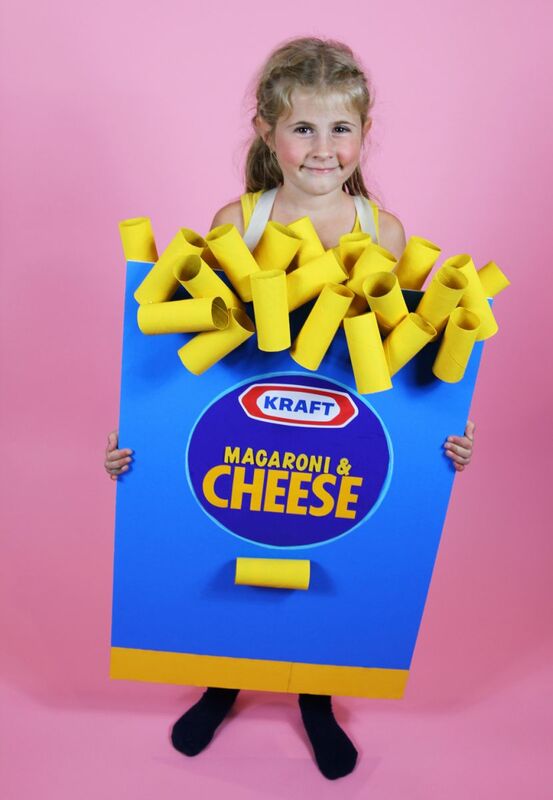 Print out the Kraft logo on photo paper and cut it out. I printed this logo and I sized it to 7" wide before I printed it. Apply with spray glue to the top of the blue circle. 7. Cut out two 10" x 3" strips of yellow construction paper and also apply those to the bottom of the board. 8. Hot glue your pasta tubes to the top of your macaroni box. Layer them so it looks like pasta all mixed up. We put just a couple on the back. You don't want to make it too uncomfortable. I also glued one below the circle. 9. To finish the board I glued two ribbons to the back of the board and made them long enough to tie around my child's neck.